They’re rare. There are very few that exist in the marketing world. These are the marketing tactics that affect both traffic and conversions. The two most important numbers in digital marketing are traffic and conversion rate. Multiply the first number by the second and you get leads, sales, subscribers or whatever success means to you. 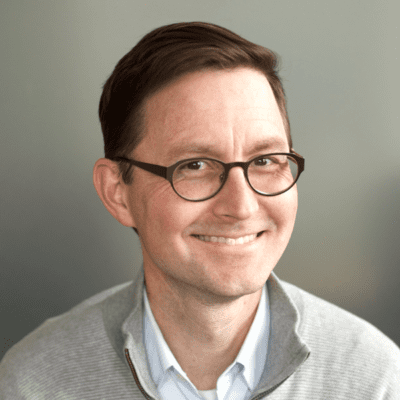 Everything we do in digital – each action we take in marketing or web design – should grow traffic or improve our conversion rate …or why do it? Each action should impact one of these numbers. But there are only a few actions impact both. Let’s look at those rare gems that can boost the numbers on both sides of the equation. Our first dual-purpose gem is the website testimonial, and it’s something that should be easy to add to any page, right within the body of the content. Testimonials increase trust which increases conversion rates. They are social proof. They’re evidence that you do what you say you do. Without them, your website is filled with unsupported claims. Add photos, names, job titles and company logos. This makes them more personal, real and credible. Keep them short and put the most impactful part of the statement at the front of the testimonial. Text is visible to search engines. Any text. That includes text in testimonials. So if that happy blurb that your customer gave you includes a keyphrase, it can help your rankings. Make sure the testimonial includes the target phrase (or a variant of it) somewhere in the text. Include many testimonials. Pages with lots of copy tend to perform well in search. Here’s a complete guide for website testimonials with examples. Our next combo tactic is the architecture of the website itself. Your header navigation is managed within your content management system (it should be easy to change). Just a little change can make a big difference. The labels in your website navigation indicate the relevance of the pages on the website. Navigation labels are a factor in search engine rankings. Poor website navigation is one of the most common SEO mistakes. Be specific. Navigation items such as “products” or “services” don’t indicate relevance to search engines. Instead, name the category of products or the types of services if at all possible. Avoid too many items in your navigation (including drop down menus, if possible). If the top-level navigation links to 100 different pages, then the authority passed from the home page to each interior page is divided by 100. Make sense? If not, check out this animation about how links work in Google. Tons of top-level navigation items reduce the likelihood that interior pages will rank. It’s one of the most prominent elements on every page. Visitors’ eyes move to the navigation almost immediately. If the navigation communicates quickly, the visitor will engage with the site, increasing the likelihood that they’ll dig deeper and eventually convert. Visitors who don’t see what they’re looking for quickly are more likely to bounce. Again, be specific in your navigation labels. Help the visitor find what they came for. Make every click predictable, so they know how to find things fast. Follow expected standards. Put contact information in the top right. If you have a search bar, include it in the header. Move social media icons to the footer. 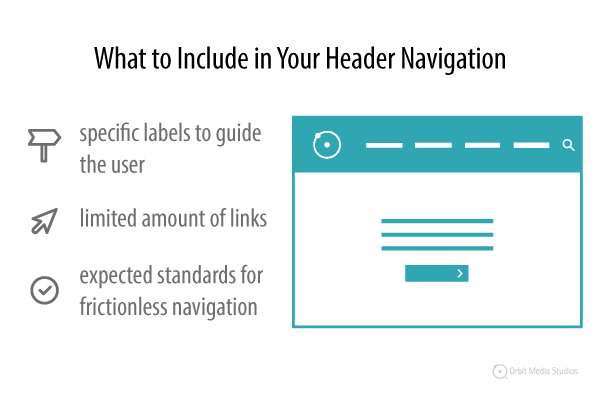 These are three ways to align your header with web design conventions and standards, reducing friction and increasing conversions. Just like the header, a great website footer can affect search rankings and conversion rates. 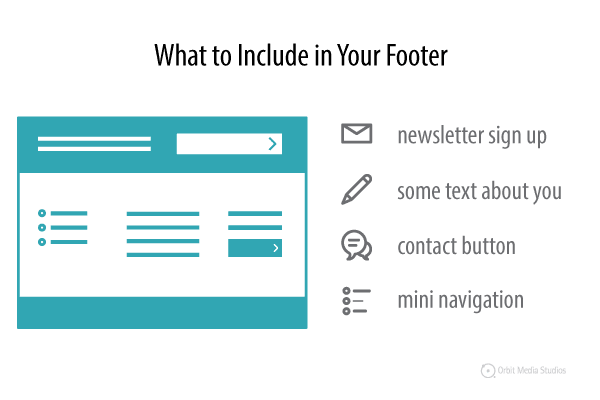 If you don’t have a high-performance footer on your site, it might take a bit of design and programming to fix. But it’s worth it if it impacts both of our two main metrics. True, items in the footer are less likely to indicate what the page is about, so Google puts less importance on footer copy and links. But it is still a place to include search friendly copy and links. Add a sentence or two about what business you’re in, or even add a short paragraph. Use the primary keyphrase from your home page. Add a mini-navigation bar, linking to your top five or six product or service pages. Use the target keyphrases as the anchor text of these links. These don’t need to be identical to your main navigation. Your website footer is “global” meaning that it appears on every page. Add something in the footer and it appears everywhere. So a call to action here (typically contact or subscribe) is going to be there for every single visitor if they fall and hit the bottom of any page. Put a “Contact” button or call to action, along with your phone number and address somewhere in your footer. Use color to make this the most visually prominent element. Note: Email links don’t count. Never put an email link on your website. If you’re doing content marketing, here’s another good place to let visitors subscribe. But go beyond the basic “Sign up for our newsletter.” Any email sign up box should have the three P’s of a good signup form: prominence, promise and proof. Suppose you’re trying to convince Google that you’ve made the best page on the internet about a topic, such as hedgehog grooming tips. If this really is the best page on that topic, then there should be at least one link to it, somewhere on the internet, with “hedgehog grooming tips” in the text of the link, right? The problem is that it’s hard to get someone to link to you with that phrase as the exact text of the link. It’s just not that likely. The solution? Link to yourself. Link between pages on your own site. Once you publish a page that targets a phrase, find at least one other page on your site that references the topic, then add a link to the new page using the target phrase as the text in the link. 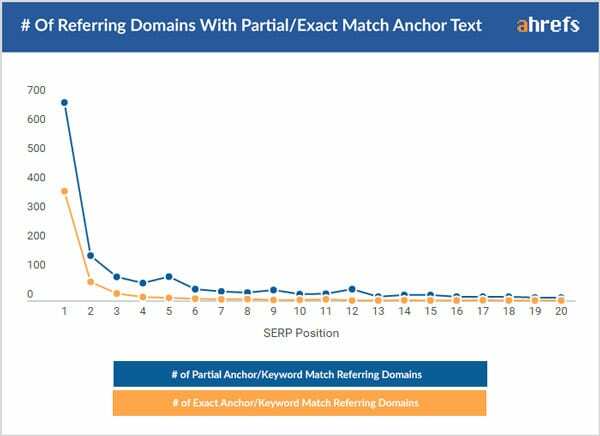 For a stronger SEO benefit, use the “Top Pages” report in Link Explorer to find which of your pages has the highest authority and can pass the greatest SEO benefit. Then find the pages that can benefit the most, these being the pages that are already almost-ranking-high according to the “Queries” report in Analytics. Link from the high authority page to the almost-ranking-high page! The main reason to add links is to move visitors through your website. Invite them to go deeper. Eventually, we want to guide visitors toward the desired actions, the conversions. Got an ecommerce site with a few products that sell well? Link to them in the descriptions of other products. Got a lead gen site with pages that convert well? Link to them in the body text of other pages. For content marketers, check your “Reverse Goal Path” in Analytics to see which of your blog posts is most likely to convert visitors into subscribers. Link to these high-converting posts from your highest traffic posts. Connect your best cheese (high traffic pages) to your best mousetraps (high converting pages) through internal links. Actions you can take today. Effects that multiply for years. These aren’t normal improvements. These items here have impact that multiply, compounding the benefits. Yes, there might be other actions that affect both traffic and conversions, such as email marketing campaigns or redesigning your website. But those aren’t so simple. With a bit of help, you can do each of the items listed here in a single day. Thanks Andy! Once again you’ve given me more productive work to do. My goal really isn’t to make homework for you. Hopefully, these tactics make us more efficient marketers. More juice for every squeeze! When we talk with physician clients and ask them for testimonials to post, more times than not, they are too general. We’re always coaching office staff to ask patients for specifics (keywords), procedure types, recovery times, etc. Yes, when the testimonial has that phrase, you’ve struck gold. We plan to write a post with more testimonial tips soon. Thanks for the comment, Mark! Nice to see you here. Hope all is well! I agree in its simplest form–traffic X conversions=success! That’s it. You’ve clarified how to maximize the impact of information marketers already have somewhere by using it the right way. Thanks for the comment, Heidi. But you knew that formula already. You’re blog is filled with super-practical tips. Recommended for readers of the Orbit blog!